As I was reading the Christmas story in Luke this year, I was struck by something that I had never considered before. It was the angels. It is not that I never noticed them in the story before, but rather, I have never seriously considered what their conduct was really saying about what they were thinking and feeling. I believe that their actions confirm that they were filled with excitement and anticipation. They were like the person who buys the perfect gift for their child or friend and can’t wait for them to open it, the person who is counting down the days until Christmas morning because they can’t wait to see the expression on the recipient’s face when they open the wonderful gift. I think the angels were filled with that type of anticipation of the joy of others at the gift (Jesus) that was coming. Can you imagine the excitement in heaven when the angels learned that Jesus, God incarnate, was going to be born a man and live among men? What anticipation they must have felt for what the Son of God could do for man. The light that surrounded Him in heaven would follow Him to earth. Oh what a great day when the darkness that hovered over man would be dispelled, banished from His presence! What great excitement the angels must have had for man. The angels, while created being like man, share the creator’s hand. However, they are “higher” beings than man according to Psalm 8:51. Man, however, has the distinction of being created in the image of God2, a description never used of the angels. This trait we share with Jesus who is described as “the image of the invisible God.”3 The angels are with God in heaven.4 In their positions in heaven, in the presence of God, the angels have seen a lot. They would have witnessed the creation of man, the flood, the ark, the tower of Babel, the destruction of Sodom and Gomorrah, the turning of Lot’s wife to salt, the exchange between God and Satan regarding Job, the battles between the angels of God and the angels of darkness, and all the other goings on in the throne room of the Most High God. I don’t think they would be easily impressed. your ways.”7 They have a very close relationship with God and witness His glory and power without end. They are in sync with the will of God. Angels do what God likes.8 Of course, angels are not omniscient (all-knowing), so they have to wait to find out what God has planned, but in contrast to us, they are a lot closer to the action. When angels appear on the scene in the Bible, people are always moved. Manoah was so upset when he saw an angel that he told his wife he was going to die.9 When an angel came to Daniel, he trembled on his knees and palms.10 When Zachariah was visited by an angel in the temple, “he was troubled, and fear fell upon him.”11 He left the encounter unable to speak for at least nine months. When Mary was visited by the angel Gabriel, she was troubled.12 When Peter was in prison and the angel came and “stood by him, and a light shone in the prison; and he struck Peter on the side and raised him up, saying, “Arise quickly!” And his chains fell off his hands.”13 Now that is the stuff of action movies. So it was, when the angels had gone away from them into heaven, that the shepherds said to one another, “Let us now go to Bethlehem and see this thing that has come to pass, which the Lord has made known to us.” And they came with haste and found Mary and Joseph, and the Babe lying in a manger. Now when they had seen Him, they made widely known the saying which was told them concerning this Child. 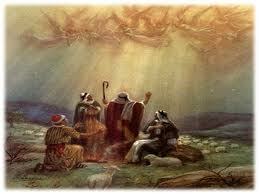 And all those who heard it marveled at those things which were told them by the shepherds. 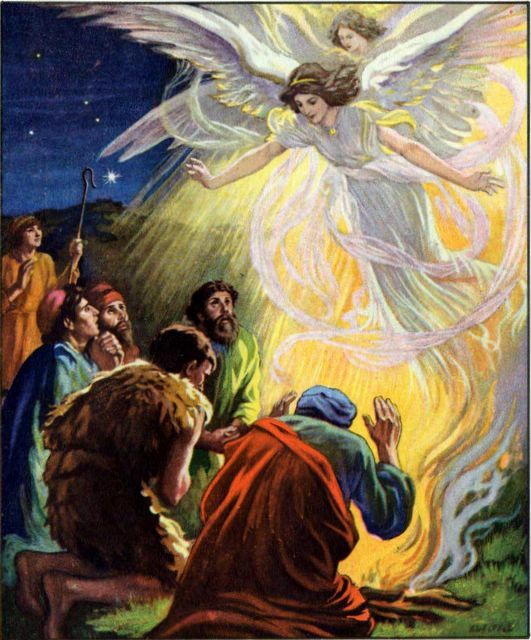 The events that unfold next confirm that the shepherds received the message from the angels because they decided to go to where the baby was. We also know that they must have been moved greatly by what they saw because they told lots of folks. It should be pointed out here that part of the skill set for shepherding is not necessarily addressing crowds regarding miracles, but we see that “all those who heard . . . marveled at those things which were told them by the shepherds,” so the shepherds were not staying silent or isolated with the good news. All that to say, I was struck by how excited the angels were. They know God, and they observe man. They knew that God coming to earth as a man (Jesus), was a good thing for man. They were so excited that they wanted to tell man (shepherds), so they wouldn’t miss it. Angels, who dwell in heaven, with God, where all the really cool stuff happens, were excited for us, mankind, that God was coming to live among us. They knew that His coming would mean that we would have hope, that we would not have to continue to dwell in darkness, separated from the God who was so holy, loving and majestic – King of Kings and Lord of Lords. They saw our future to be bright with Jesus. They knew what it meant to have Jesus living with you. That is what the angels’ conduct was saying that Christmas night over 2000 years ago. What is your conduct saying about the message of Christmas? Are you, like the angels, rejoicing because you know God and you know His plans for man are for good and not for evil? Are you, like the shepherds, going to find Jesus daily in the pages of your Bible, and sharing his love in the pews of your church, in the streets of your city, and in the corridors of your work place? Are you telling people about Jesus because you know He alone has the words of eternal life? My prayer for you . . . for me . . . is that this Christmas season, we would be like the angels and like the shepherds. Each of them did what they did because they had an encounter with God.